Linda Sue Mutascio loving mother and wife, a longtime resident of Chadds Ford passed peacefully on March 31, 2018. She is survived by her three children Richard Mutascio, Michael Mutascio, Jennifer Mutascio, and her son-law Stephen Huber, niece Stacie Harrison, and brother Gary Harrison. Predeceased by her husband Michael Charles Mutascio and her brothers Larry Wayne Harrison, Michael James Harrison and Eulis B Harrison. Linda was an animal lover and a restaurant owner. Relatives and friends are invited to attend her viewing after 10 am, Friday, April 6 in James R. Baskwill Funeral Home, 20 W. Montgomery Ave, (half block west of York Rd) Hatboro, where her funeral service will be held at 12 pm. 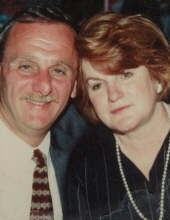 Her interment will follow in Edgewood Memorial Park, Glen Mills, PA.
To share a memory of Linda, please visit the funeral home’s web site listed below. To send flowers or a remembrance gift to the family of Linda S. Mutascio, please visit our Tribute Store. "Email Address" would like to share the life celebration of Linda S. Mutascio. Click on the "link" to go to share a favorite memory or leave a condolence message for the family.